I'm home sick right now. Should I rest up? Nope. 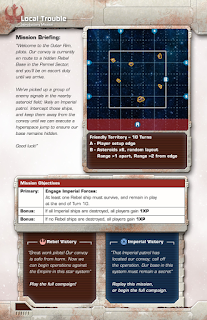 Sounds like a good time to try the fan made Star Wars X-Wing campaing, the Heroes of Aturi Cluster. Quick verdict is that this is going to be great. The campaign comes with an intro mission called Local Trouble. 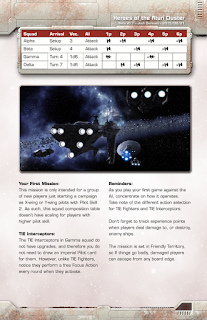 It's designed to let the players get a couple of XP and to get used to the mechanics. Each mission comes with a bit of story, a deployment map, victory conditions and special rules. It might be hard to see in the image below, but the deployment map is broken into range 1 squares. This lets you know exactly where to place things. In the game I played, two TIE Fighters were deployed, one at each of the blue dots on the north end of the map. I deployed in the red band. Then, game play starts "as normal". This is what my initial deployment looked like. 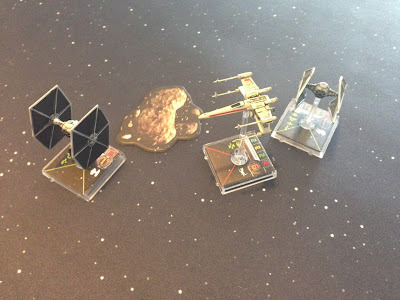 I'm the X-Wing in the corner, with my two opponents across the map. If I'm alive at the end of Round 10, I win. If not, the Empire wins. In the Heroes of the Aturi Cluster, the Empire always has initiative. The game work as normal in that the game round is identical. You choose a maneuver and then ships activate in initiative order, followed by shooting. The major difference is that there is obviously no Empire player. 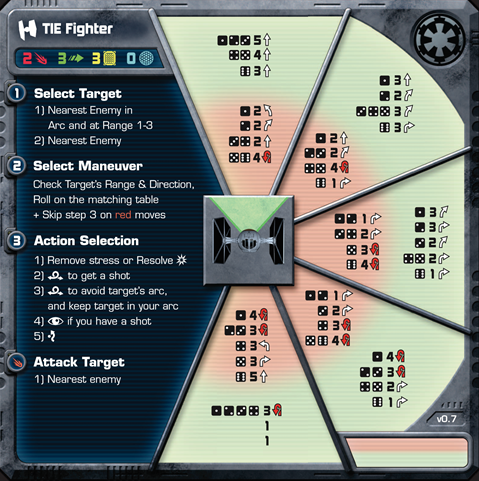 Each ship picks a target using the "Select Target" logic. It's different for every ship. Then you roll off to select a maneuver. Depending on which direction the target is, you roll on a different table above. Red band if the ship is at Range 1 or Range 2 and coming towards the TIE. Green band if the ship is at Range 3 or Range 2 and moving away from the TIE. The card then tells you what action to pick. Attacks happen as normal during the combat phase. I ended up losing the mission, but gained 3XP in the process. 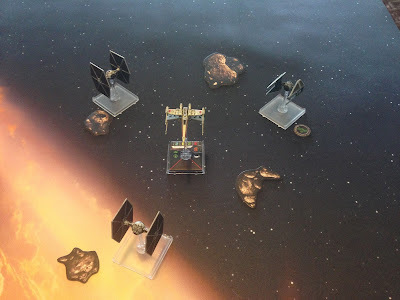 Because I died, I had to roll on an Eject Table, losing one of my upgrades in the process. It was a net loss of 1 squad point. 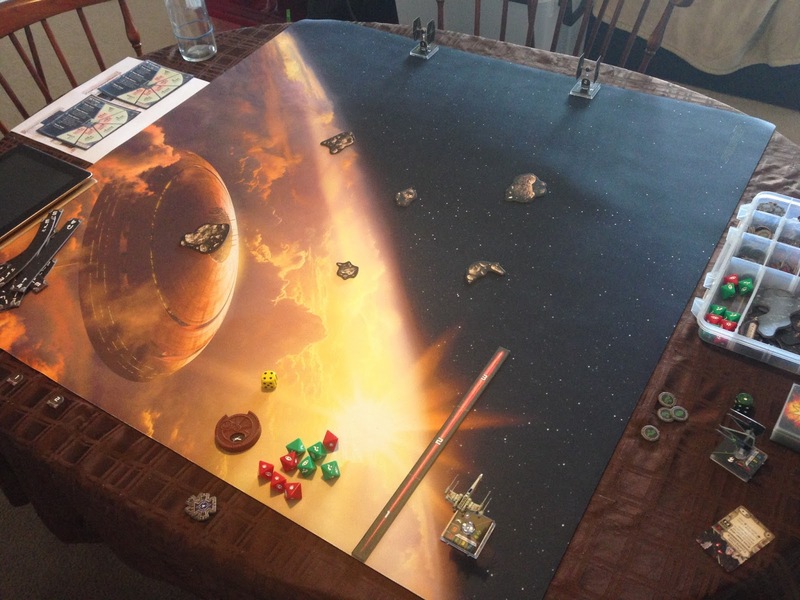 Realistically, in a campaign situation, I would have just flown off the table, kept my upgrade and kept the 3XP. This is super fun. 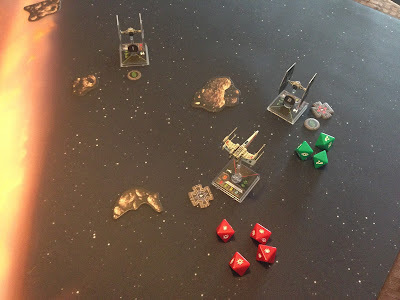 If you play X-Wing, try it out ASAP.